Publicado por Vicente el 23 de junio, 2014 . 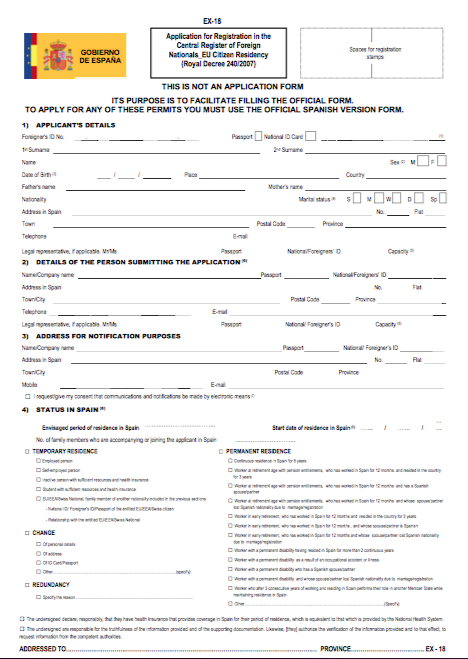 The citizens of a Member State of the European Union, of another State party to the Agreement on the European Economic Area or Switzerland who will reside in the territory of the Spanish for over three months period are required to apply for registration in the Central Register of Foreigners. The procedure should be performed by the interested party and must be submitted with the form EX 18 in Spanish and all necessary documentation. So that all citizens can make the whole process somewhat easier for the Secretary General of Immigration and Emigration has released the EX 18 form in English.